EuroPD and ISPD will be jointly hosting the 2020 Congress in Glasgow, Scotland, from 2-5 May. This will be the largest gathering of PD experts in Europe and it is expected to attract over 2,000 delegates from around the world. The programme will aim to strengthen participants’ knowledge of PD and Home Haemodialysis on a national, regional and international scale through a multidisciplinary programme. We hope you can join us and take this opportunity to share best practice and develop future collaborative partnerships for many years to come. A view of the Clyde Auditorium “The Armadillo” (left) & the SSE Hydro arena (right). 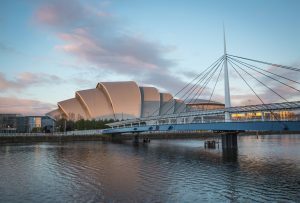 These attractions are located on the site of The Scottish Exhibition and Conference Centre, Glasgow.